Here in the South coast of Maine, we are fortunate to have several Summer Stock Theater companies nearby. These shows vary from a small production of Shakespeare in the park to a lavish Broadway-like all singing and dancing night out. Either way, we can’t recommend them enough if you’re looking for a way to spend an evening while here in Kennebunkport. Here’s a summary of what’s going on nearby this summer. 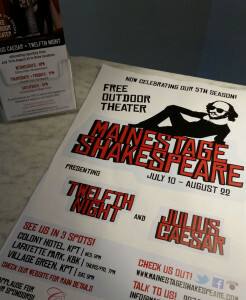 MaineStage Shakespeare has become a huge success for people living in the Kennebunks. Now in its fifth season, a dozen or more theater majors, or recent graduates, come to the Kennebunks to perform in Shakespeare’s plays. They also teach and mentor 150 local kids in what is known as ShakeStars, an acting summer camp held at Kennebunk Recreational Center. Every Saturday these youth also get the opportunity to perform the Bard’s most iconic scenes, coached by the Shakespeare performers. They are a big hit with the local community. This year, the MaineStage actors themselves will be performing the Bard’s Twelfth Night and Julius Caesar with shows running from July 10th – August 22nd. They perform at the Village Green in Kennebunkport (a 10 minute walk from the Inn), the Colony Hotel and Lafayette Park in Kennebunk. Tickets are free but please consider a donation to thank them for the entertainment and help ensure they can keep coming back to Kennebunkport. Check out their calendar of performances here. We are in our second year of sponsorship with MaineStage and they were kind enough to send Jay Ben and Aidan over yesterday for a private performance for our guests over breakfast. We saw Cassius and Brutus plotting against Caesar. No sword fighting this year, but the dialogue was amazing. Thanks Guys! Another summer stock theater is The Arundel Barn Playhouse on Old Post Road in Arundel, Maine (a 10 minute drive from the Inn). Adrienne Grant, Producing Artistic Director will produce eleven weeks of musical theater: June 16th to August 30th. In those eleven weeks, she will have Nunsense A-Men (6-16 to 6-27), The Addams Family (6-30 to 7-11), Disney’s The Little Mermaid (7-14 to 8-1), LaCage Aux Folles (8-4 to 8-15), and Beehive: the 1960s musical (8-18 to 8-29). The performances are done in a barn that was built over 100 years ago by the William E. Smith Family. Before it became The Arundel Barn Playhouse, it was affectionately known by locals as the Smith Sisters’ Farm. Marcia Smith lived there from 1887 until her death in 1987, and Angelia Smith lived with her older sister from 1893 until her death in 1985. Adrienne Grant describes an evening at The Arundel Barn Playhouse as “an evening in the Mickey Rooney / Judy Garland tradition, providing the best professional entertainment in a beautiful New England environment with old fashion hospitality.” The excellent actors with their incredible singing voices are renowned year after year, with such performers as John Lloyd Young, who received the 2007 Tony Award for the Broadway play, Jersey Boys. Tickets are $35 to $40 and $15 cash for students at the door. If you are in the mood for a classic theater evening, you are a short 30 minute drive from the Ogunquit Playhouse. In 1933, in a renovated garage, Ogunquit Playhouse opened the doors for the first time. Broadway Showman, Walter Hartwig and his wife Maude dedicated their lives to top-quality theater outside of New York City. They started the “Manhattan Theatre Colony” and brought it to the summer town of Ogunquit. The reputation of Walter Hartwig enticed many theater legends including Maude Adams, Ethel Barrymore and Laurette Taylor to star with the resident company. Ogunquit Playhouse continues to carry on Walter and Maude’s legacy as “America’s Foremost Summer Theater”. The performances for this summer are Victor Victoria (6-24 to 7-18), Nice Work If You Can Do It (7-22 to 8-15), with well-known actresses Sally Struthers and Valerie Harper , and Million Dollar Quartet (8-19 to 9-19). Also, for children, there will be Winnie the Pooh (7-25 and 7-26), Shrek the Musical (8-8 and 8-9), and The Aristocats Kids (8-22 and 8-23). Tickets start at $44 and can be purchased online. Catch a matinee or make an evening of it. Want to see how it’s all done? Treat yourself to a backstage tour. The cost is $10 for the full 90 minute “Behind the Scenes Tour.” A 45 minute “Stage Door Tour” is also available on specified dates for $5. Check out their website for full details. Please give us a call if you have any questions or need help with planning your stay. We hope to see you soon!